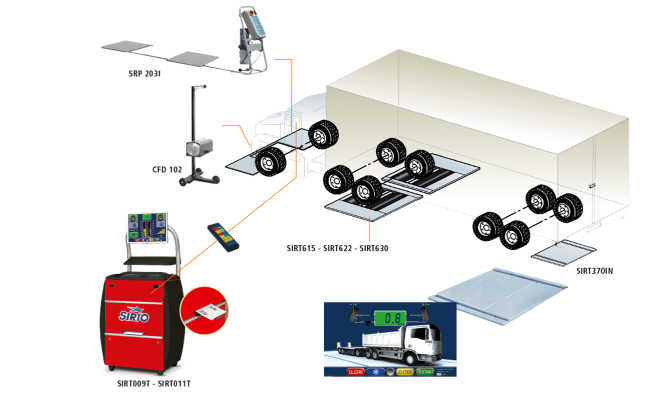 The Sirio test and diagnosis system for commercial vehicles sets today’s standards for professional operators and test centres. Thanks to the user interface, the unit can be managed either by infra-red remote control or by the control panel keyboard. Workshop heading, configuration and test modes (automatic, manual test,….) can also be entered from the keyboard. • “Ministerial” operating mode testing, in conformity with legally prescribed test procedures in the various countries. The sturdy structure, sized for a maximum axle load and the sophisticated system of extensometer-type sensors ensure high measurement precision and excellent result reproduction.